The exhibition, which will be located within a 13-meter trailer in the parking esplanade of Levante (next to Kaleido) from 17.00 to 00.00 on 25th July. 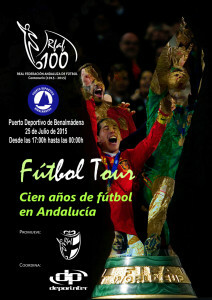 “The exhibition will also present all the details of a century of history of Andalusian football, and there will be a series of activities for the whole family,” the councillor pointed out. Besides photos of the 2010 World Cup and the European Championships of 2008 and 2012, there will be a series of parallel activities for the whole family, like football-tennis or a human football. See you there!! This entry was posted in Blog by Mark Hewitt. Bookmark the permalink.